I have two superhero skills. Two! So good, really… that I’m tempted to call them skillzzzz. My two superhero skills are: catching things that are falling (anything really, it’s cat-like agility) and making PIES! Sometimes you’re just endowed with talents beyond your ability to learn them. That last sentence I totally made up and it can’t possible be true. Suffice it to say, I can catch a falling wine glass without spilling a drop, and I can whip up a rich chocolate pecan pie in the blink of an eye. Do not, however, throw a baseball my way (I can’t catch that!!!) or ask me to make you croissants (not in my superhero wheelhouse!!!). What’s your superhero skill? If your answer is ‘long division’, I’m super impressed. Maybe your answer is ‘dish washing like a ninja’, in which case please come over, flex your skills and eat this pie. Maybe your superhero skill is ‘not eating all the cookie dough before it’s baked’. That really would be something. Maybe your superhero skill can be pie baking. I really think it should be. 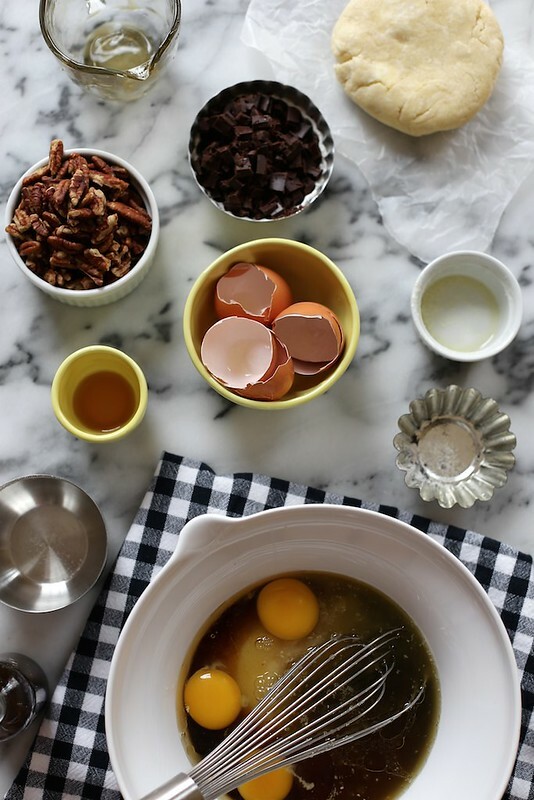 It’s just butter+flour, pecans+eggs. Rub it together. Whisk it up. Be a pie ninja. It’s all so very possible. 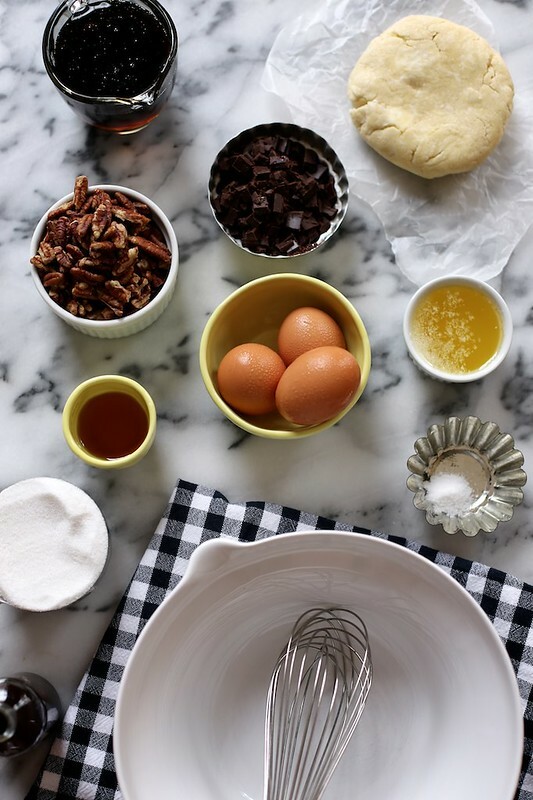 Let’s make this Bourbon Pecan Pie with Dark Chocolate. We’re showing off for the Kentucky Derby. Flexin’ because we can. I like where this pie starts. Pecans and chocolate. To chop and to snack profusely upon. Eggs are the large variety, and here in New Orleans they sweat. Melted butter meets sugar meets dark corn syrup. A good butter and buttermilk pie crust. Bourbon, for always. Some people think corn syrup is a naughty word(s). It’s got a reputation it can’t shake. When paired with eggs, pecans, and chocolate… I think corn syrup (especially the dark variety) is elevated out of its unfortunate reputation. Eggs, sugar, corn syrup, butter, and bourbon are whisked together into a… goop (for lack of a better word). Sweet and sticky (super delicious) pie filling goop. Don’t tell Gwyneth Paltrow. 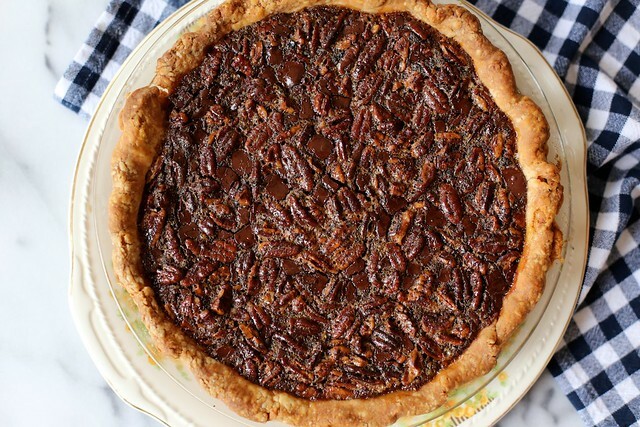 This Bourbon Pecan Pie is a single crust pie. 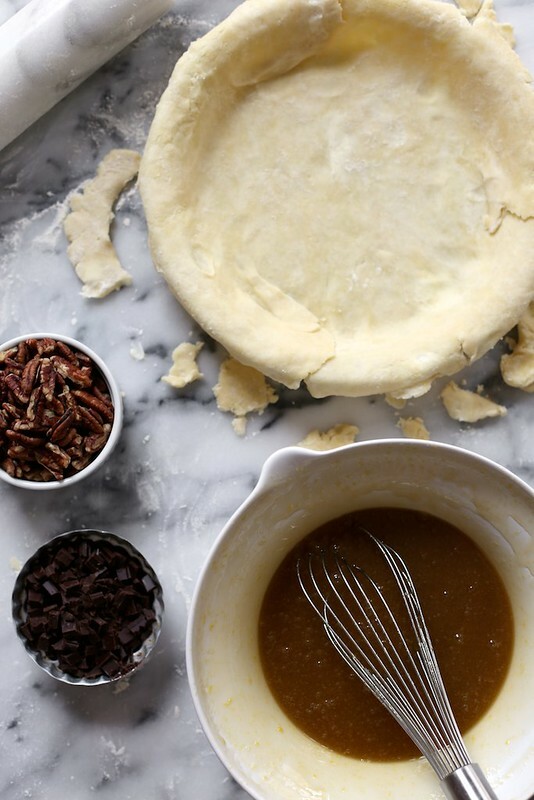 Here’s the oldest trick in the book: when making one pie crust from scratch… just make two. Cutting butter into flour for two crusts is just as easy as it is for one. Use one crust… and then be the kind of baker that has an extra homemade pie crust just hanging out in the freezer for when, you know… you need to just whip up a random pie. 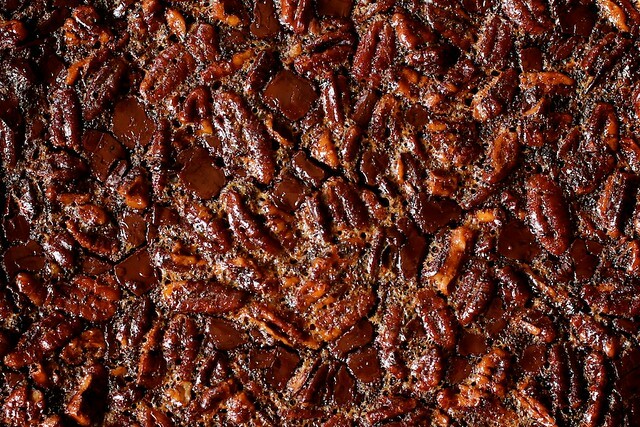 Chopped pecans and lots of dark chocolate are sprinkled across the bottom of the unbaked pie crust. It’s pretty. 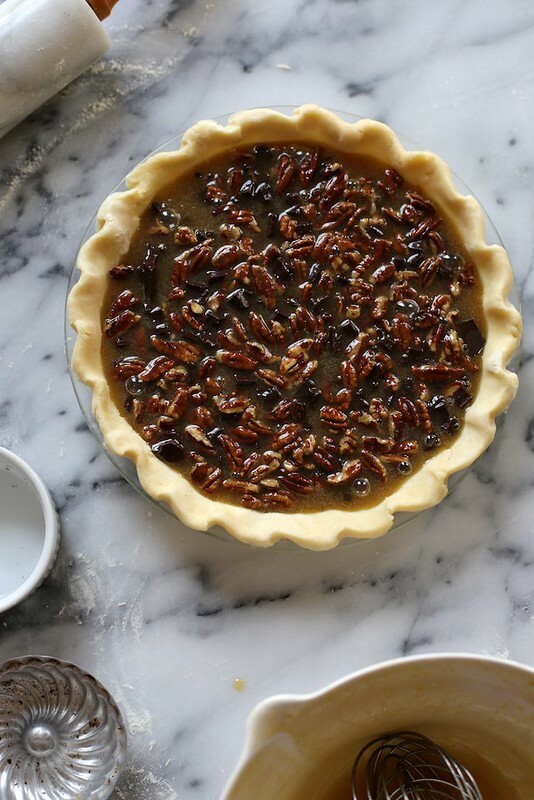 Sweet and thick pie filling is poured over the chocolate and pecans. Yes it is. Pecan pie is sweet and thick. The filling is like a soft, sweet, sugar pudding… without the cream. The chocolate adds a nice, smooth bitterness. The pecans add a big, toasty crunch. I enjoy this pie two times a year, during the Winter holidays and on Kentucky Derby day. Here’s to our super hero skills paying off, and here’s to hoping our measly horse bets pay off too! To roll out the pie crust, on a well floured surface, roll the crust 1/8 inch thick and about 12 inches in diameter. Transfer it to a pie pan. Trim the edge almost even with the edge of the pan. Fold the edges under and crimp with your fingers or a fork. Cover it with plastic wrap and refrigerate it for a minimum of 30 minutes and a maximum of 3 hours. 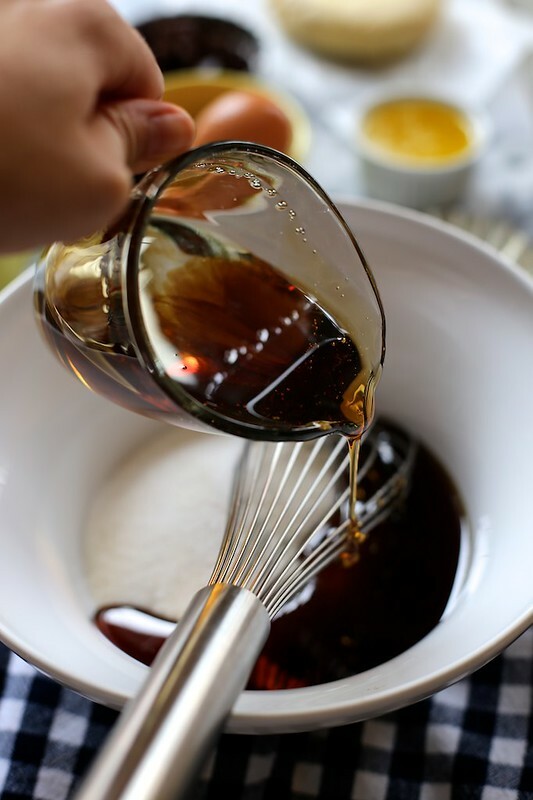 To make the filling, in a medium bowl whisk together sugar, corn syrup, salt, eggs, vanilla extract, bourbon, and unsalted butter. Whisk until well combined. The mixture will be thick and syrupy. Place a rack in the center of the oven and preheat oven to 350 degrees F.
Sprinkle pecans and chocolate around the bottom of the pie shell. Whisk the liquid filling and pour over the chocolate and nuts. Place pie on a rimmed baking sheet and place in the oven. Pie will bake for about 45 to 55 minutes. You’ll know it’s done when the pie no longer jiggles in waves, but is rather puffed and jiggles uniformly. 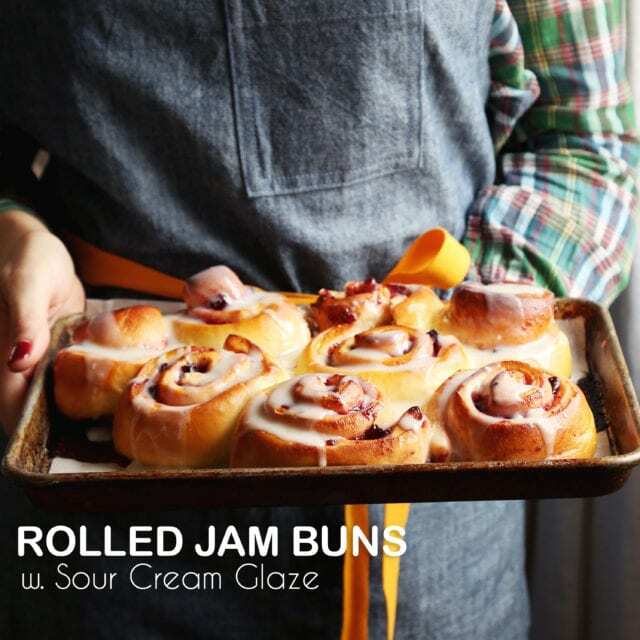 Remove from the oven and allow to cool to room temperature before refrigerating. I think this pie is best served cold the following day. What a beautiful pecan pie! I love the photos :) Looks so creamy and tempting! my superpower is getting everyone else’s life around me orgranized, but not my own. need your taxes done? let me help you with that. my own… meehhh let me extend til october. go figure. this pie looks amazing! one day i will work up the courage to make my own pie crust. i have a mental block against things requiring rolling pins. 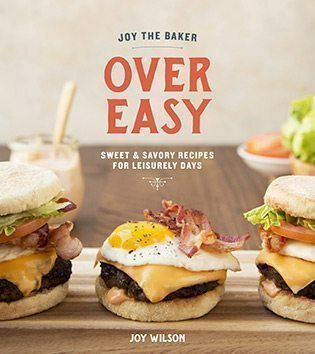 joy, this pie sounds fantastic! I was browsing around the internet recently for a bourbon pecan pie, made it, and am soooo wishing I saw this version with chocolate! What a hit! My super power is not cleaning dishes, but girl, if I lived closer to New Orleans I’d pretend so I could get some of that. Pecans weren’t something we grew up with in the tropical regions of Australia and I’d only ever read the word in books (never heard it) so thought it was pronounced ‘pee-cans’ – the ‘cans’ as in a tin can or maybe like you would say a trash can. Sometime in my 30’s I finally heard the word pronounced by an American and I had them repeat it about 100 times until I could pronounce it properly myself – it just wouldn’t roll off my tongue as smoothly as it does for y’all. Then last week I actually saw pecans in my local supermarket and I just had to buy some. I had no idea what I was going to do with them…until just now! Here in Sydney the weather has just turned a corner and there is now a definite chill in the air as we begin the descent into winter. So the timing seems to be perfect on all counts! Thanks Joy – going to give it a burl this weekend! This pie is so exciting! I think my favorite part of the Derby is the pie. Along with your mint julep recipe, I’m all set now! 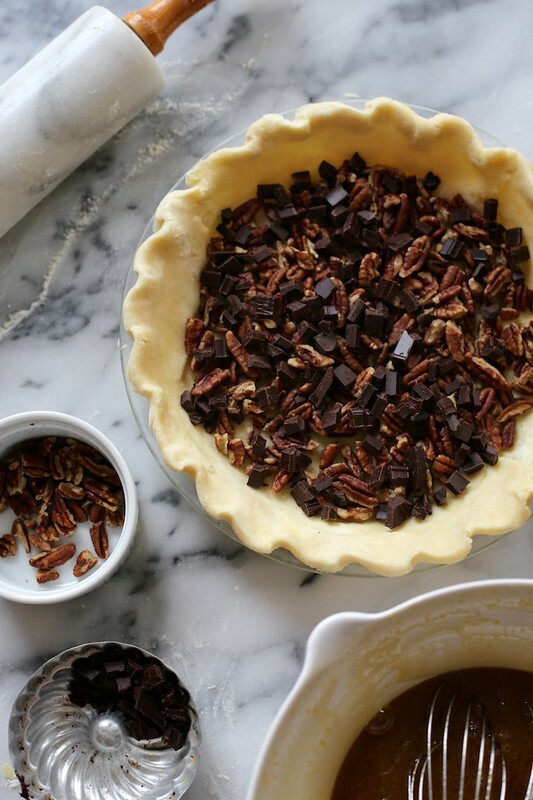 Pie with booze and chocolate is the best kind of pie. For sure. Pinned! My superhero skill has to be timing in the kitchen. I always get up to check on my baking/cooking about 10 seconds before the timer goes off. And I think I’ve burned something beyond edibility exactly once (when using a new oven for the first time). So yes, kitchen timing. It’s a jmad skill. Talking about superpowers; I think my ability to eat desserts, pie,cake etc without the sugar stomach ache is something superhuman, However it could be that I am just always hungry! This pie. My mouth. now. Hmm, my super hero skills could be being able to carry both of my kids with an open beer bottle in my shorts pocket and not spilling a drop (or the kids) true story..love the pie! my mom is the pie baker in our family, and i’m sending her this recipe so she can try to get on your level with these skilllzz! YUM.